With the rain moving in, the Jesuit Marauders JV baseball team played the Folsom Bulldogs. 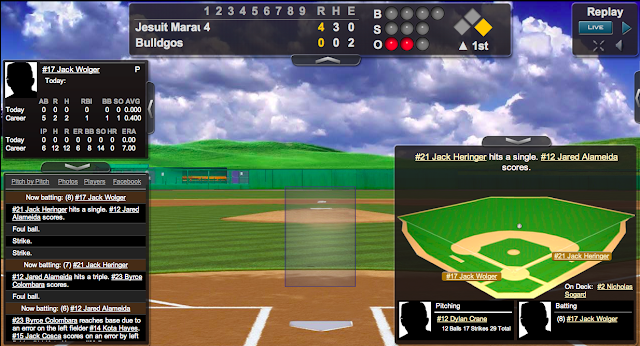 There was one player on the Bulldogs (Darrow-1B) that Jack has faced before against the Folsom Flames. Additionally, Connor Clancy is playing catcher for the Bulldogs; he and Jack went to K through 7th grade together at St. Elizabeth Ann Seton. Traveling for work, I watched the gamecast. Rod scored the game using iScore Baseball on my iPad. While I hate missing Jack play, I loved being able to follow the game live! Batting seventh, Jack was 2 for 3 with a single, a double and an RBI. In his first at-bat with two out in the top of the first and Jared on third, Jack hit a 0 and 2 pitch for a line drive up the middle. Jared scored for the RBI. Jack ended the inning there when Wolger grounded out to second. Leading off the third inning, Jack crushed a 1 and 1 pitch for a hard fly ball over the head of the left fielder in his second plate appearance. He went to third on Wolger's ground out to the second baseman. Unfortunately, Jack ended the inning there when Sogard grounded out to the pitcher and Nick grounded out to the third baseman. In his third at-bat, Jack hit the first pitch for a fly ball out to the right fielder. Play centerfield, Jack did not have an assist or a put-out. The Marauders were leading the game by the score of 9 to 0 when play was stopped. The box score is here and the scorecard is here. Wolger (1-1, 4 starts, 10.2 innings, 3.94 ERA) got the win. Striking out 8 batters, Wolger pitched four no-hit innings. The Jesuit JV baseball team now has 7 wins and 1 loss. Their league record is 1 win and 0 losses. The game log is here. The Marauders will be playing a home game against Folsom on Friday and an away game against Folsom on Friday.